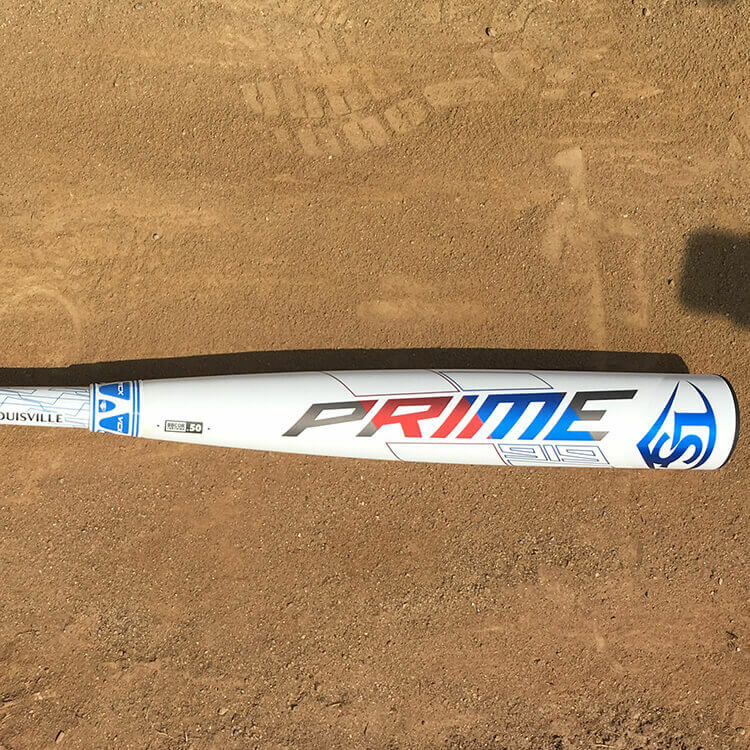 Louisville Slugger’s Prime 919 looks to continue the recent success of the Prime bat line. It is a balanced multi-piece composite that features a large barrel with minimal vibration on mishits. It is the most expensive bat in Slugger’s lineup so far. The base color is white and is complimented by red, gray, and several shades of blue. I love the color and design of the barrel graphics. The new VCX connection piece is rubberized and looks pretty cool. The handle is is white with a dark gray grip applied. The entirety of it is covered in a geometric pattern. 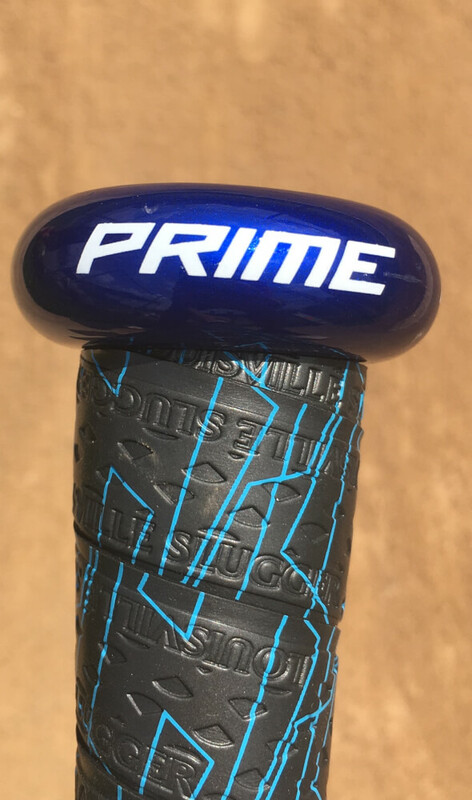 The knob is blue and includes the word ‘Prime’. You can also customize the Prime 919 for $580. 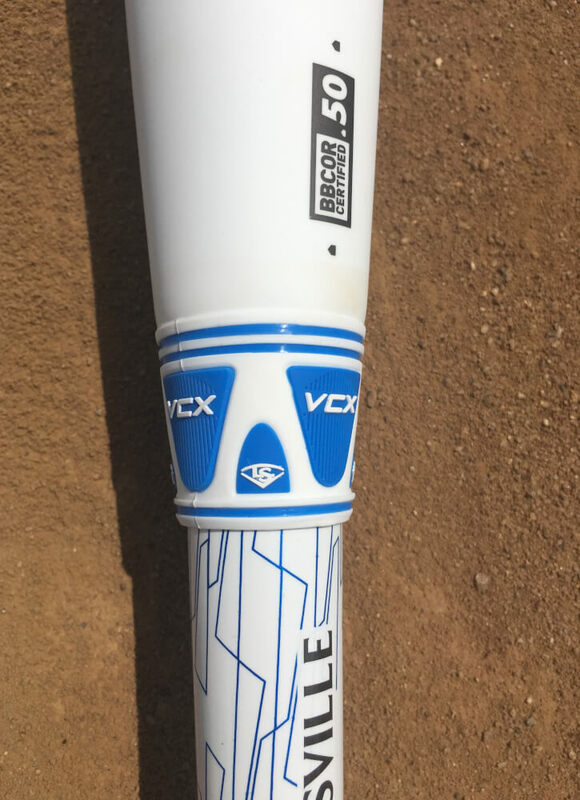 One of the biggest changes Slugger made to their 2019 bat line is the reintroduction of their own grips. Since 2016, Slugger bats used Lizard Skin grips. The grip is on the thinner side and feels almost identical to a Lizard Skin. If it didn’t have the Louisville Slugger logo on it, I wouldn’t have been able to tell the difference. Its a quality stock grip. The grip is pretty short and if you choke up over an inch it might get a little uncomfortable. The handle is thin and comes with a slight taper into a conventional knob. The 919 is a balanced bat with a light swing weight. 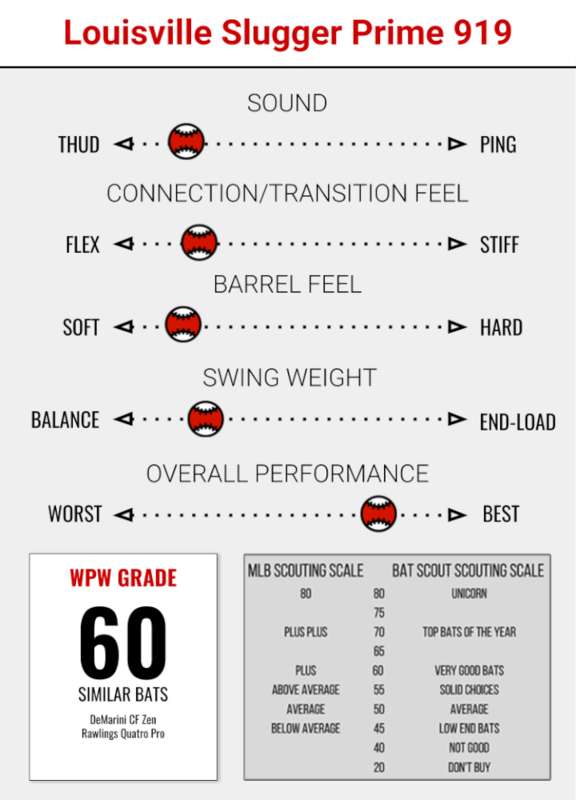 Louisville Slugger released an MOI chart this year so you can compare every bats’ swing weight. The lower the number is on the chart, the more balanced the bat is. 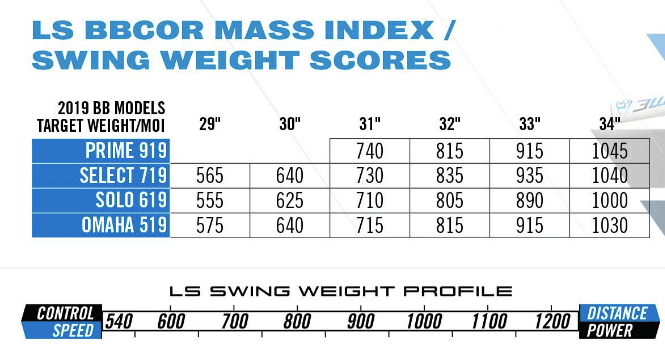 If you compare the swing weight of Slugger’s 33″ models, the 919 offers the second lightest swing weight in this year’s line. Sometimes with the ultra-light two-piece composites, the balance is overwhelming and it feels like you’re just swinging the handle. This is not the case with the 919. It feels balanced in your hands but you can still feel the barrel throughout the swing. If you want the lightest swinging bat on the market, the 919 probably isn’t for you. But if you’re looking for a balanced two-piece composite that you can actually feel throughout the swing, the 919 is a phenomenal option. I enjoyed swinging the 919. It feels very similar to the 918, which is expected and is by no means a bad thing. The only structural difference between the two is the new VCX connection piece. I didn’t feel much of a difference with regards to the connection piece, and I had a 918 with me to compare it with. As I said before, I love the balanced feel of the bat. This feel paired with a meaty barrel made for a very comfortable swing with plenty of room for error. Because it’s a multi-piece composite, the 919 feels very soft on contact. It’s probably one of the softest feeling bats on the market. Because of the bat’s massive barrel, you have plenty of room for error outside of the sweet spot. If you miss on either side of the sweet spot, the ball still has a decent exit velocity. On contact, the Prime makes the “composite thud” sound. Personally, I don’t really like the sound but the ball’s still flying off the barrel so its easy to get over it! As for a con, I found the knob to be uncomfortable. I grip the bat as far down the handle as possible, and it was annoying to have the knob rub against my bottom hand. This can be fixed easily with some tape. 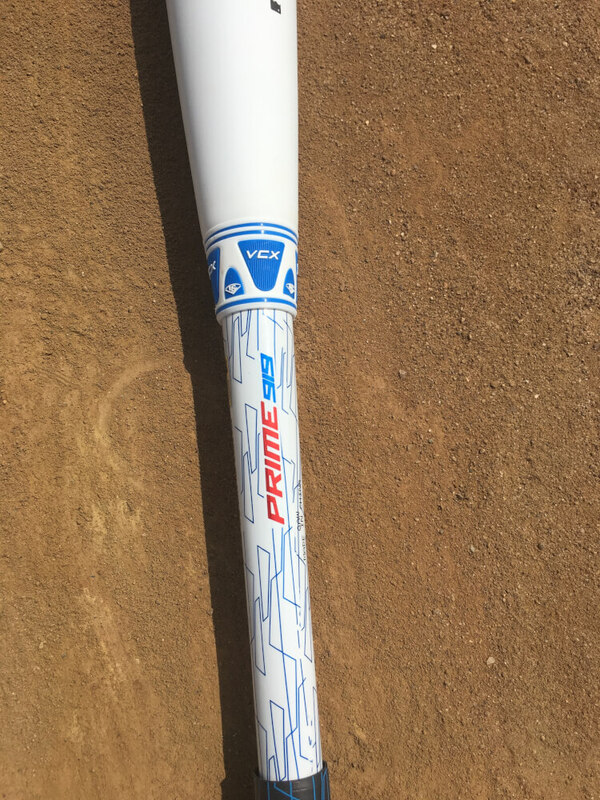 The Prime 919 is one of the best performing composite bats on the market. Its large barrel and light swing weight will appeal to a lot of hitters. It’s comfortable to swing no matter where you hit it on the barrel. Louisville Slugger did a great job as always.